Many narrow canyons cut into the foothills of the Kaiparowits Plateau at the center of Grand Staircase-Escalante National Monument, and two of the Paria River drainage system have become quite well known - Bull Valley Gorge and Round Valley Draw. Waters of the latter flow south into the larger, wider Hackberry Canyon which then joins Cottonwood Creek, and this in turn meets the main river, a couple of miles south of the site of the old town of Paria. 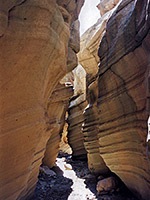 The canyon formed by Round Valley Draw has about a half mile of deep, cool narrows through the light-colored, narrow layered Navajo sandstone rocks typical of this region. There are a couple of dryfalls to overcome but no major obstacles and the most interesting section can be explored in just 2 hours. The canyon is reached by the Cottonwood Canyon road - the useful shortcut between US 89/Lake Powell and Bryce Canyon National Park. From the north end it is a 14 mile drive south then east, past the turning to Kodachrome Basin State Park, up and over several steep ridges to the streamway, which crosses the road a few miles before the frequently visited landmark of Grosvenor Arch. A side track is signposted to Round Valley Draw - this follows the shallow valley south for 1.5 miles, near to where the canyon deepens. There is one difficult stream crossing early on, then a second soon before the start of the narrows, just before which is a good place for parking, although the road does continue - it runs in the creek bed for a while then up the far side, on to the Rush Beds plateau and Booker Canyon. Off road vehicles can drive further down the creek, right to where the deep part of Round Valley Draw begins. 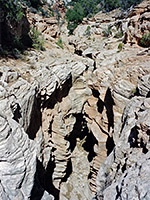 In the late 1990s the BLM installed a trail register nearby, and it shows that on average one or two groups visit the canyon every day during the summer months. As with all upper Paria tributary canyons, the Draw is within the Grand Staircase-Escalante National Monument but no permit is needed for exploration. 8 views of Round Valley Draw. TopoQuest topographic map of Round Valley Draw. 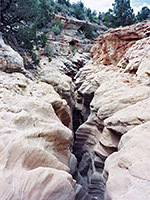 After a 20 minute walk downstream from the parking area, the canyon proper starts abruptly - the creek cuts into the top of the Navajo sandstone layer via a three-stage drop of 15 feet, descent of which may be aided by a tree stump wedged between the rocks. This is easy enough going down but moderately difficult to climb back up. Most of the gorge thereafter is often muddy although usually without any major pools; a few days after rainfall the deepest water that requires wading is typically just 1.5 feet. 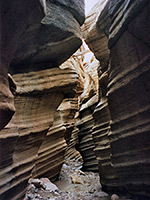 The early narrows are particularly pretty with lots of thin tilted strata eroded into curves and ridges, and plenty of places where the sun illuminates the passageways and reflects along the canyon walls. Soon after the entrance there is an alternative means of entry down the west side of the gorge - a near-vertical climb of about 30 feet using stepped rock ledges, which may be an easier egress point if there is no tree stump to aid the climb out of the upper end of the canyon. After here, Round Valley Draw deepens steadily, becomes quite dark in places with overhanging rocks partially hiding the sky above. A slightly wider section with many large fallen rocks ends in a drop of around 15 feet - an obstacle that may need a rope to overcome though at other times an easier route is possible underneath the final large boulder. 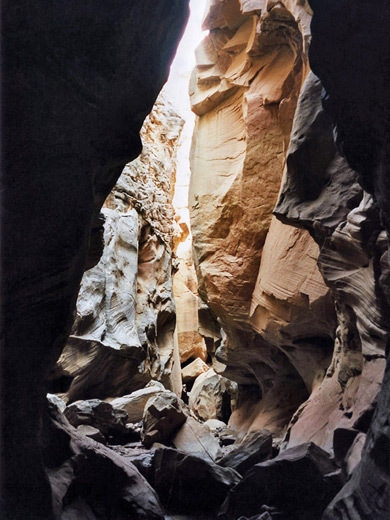 Next is the narrowest, deepest part of the draw, then the walls become less sheer and the canyon gradually opens out while continuing to deepen. Trees and bushes begin to grow at the sides and there is not much change for the next 1.5 miles, to the junction with Hackberry Canyon. Two climb-out routes along steep short, side canyons on the west side offer alternative ways back to the start point. A round trip (5.5 miles) to the Hackberry junction takes around 3 hours.